Chocolate Dipped Shortbread is the perfect 5 minute semi-homemade cookie recipe. The best shortbread recipe to make when you’re short on time and need dessert or a gift! 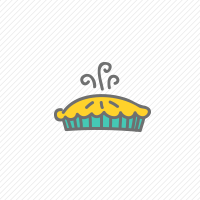 Did you run out of time to make dessert for a party? Or maybe your kid told you she needs a dozen cookies for class – in an hour! 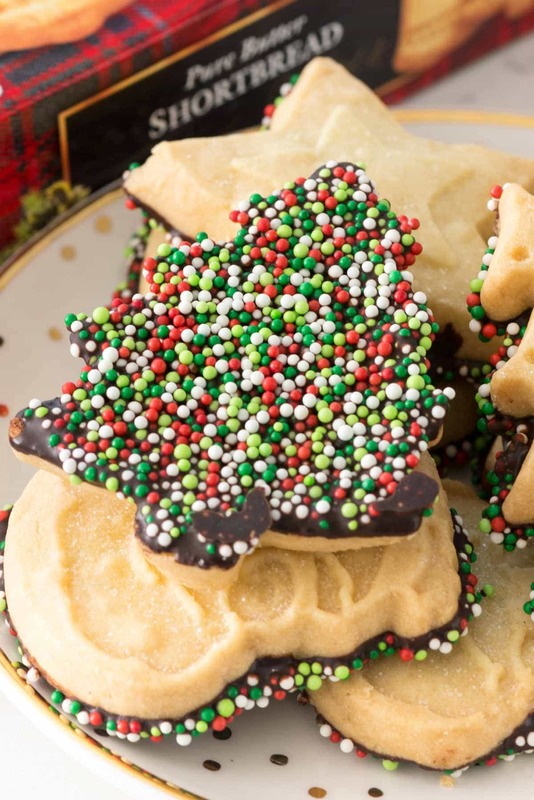 This chocolate dipped shortbread cookie recipe is perfect for those times. Everyone loves shortbread dipped into chocolate with sprinkles on top! This is the perfect 5 minute semi-homemade cookie: EASY Chocolate Dipped Shortbread. Perfect for when you only have a few minutes and need dessert or a gift! Melt chocolate according to package directions. I like using a paper Dixie bowl for easy clean up. Line a cookie sheet with wax paper. Place sprinkles in a shallow dish. Dip the bottom of the cookie in chocolate, then dip in sprinkles. Set on prepared cookie sheet to harden. Need more last minute dessert ideas? This post is sponsored by Walkers Shortbread. All opinions are 100% my own. I love this! I seem so short on time so this is the perfect way for my daughter and I to prep a holiday treat together. How did you dip the cookie in chocolate without destroying the cookie? It was easy – the Walkers are pretty solid so they don’t fall apart. Hi there!! This is a genius idea. I can’t believe I never thought of doing this. 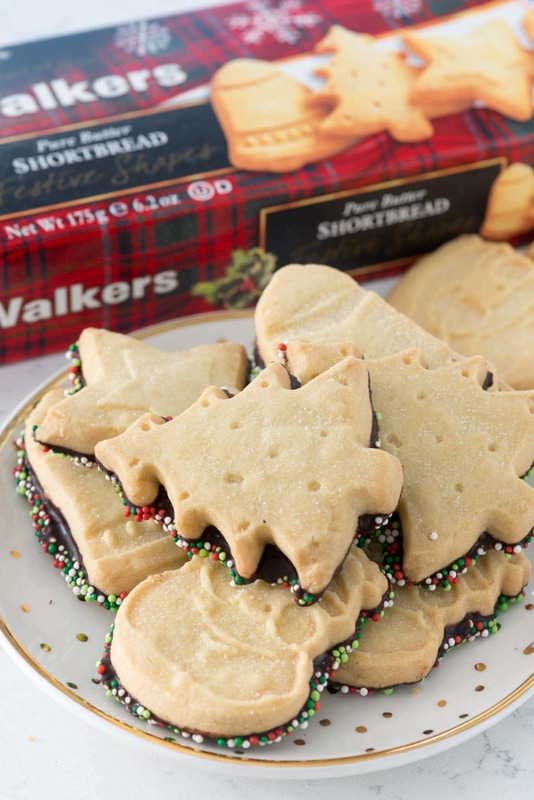 I love shortbread cookies and Walker’s are the best if you don’t have time for homemade shortbread. Thank you for sharing and have a very Merry Christmas! !